As a professional wildlife artist I paint under the name of Ruth Baker Walton. 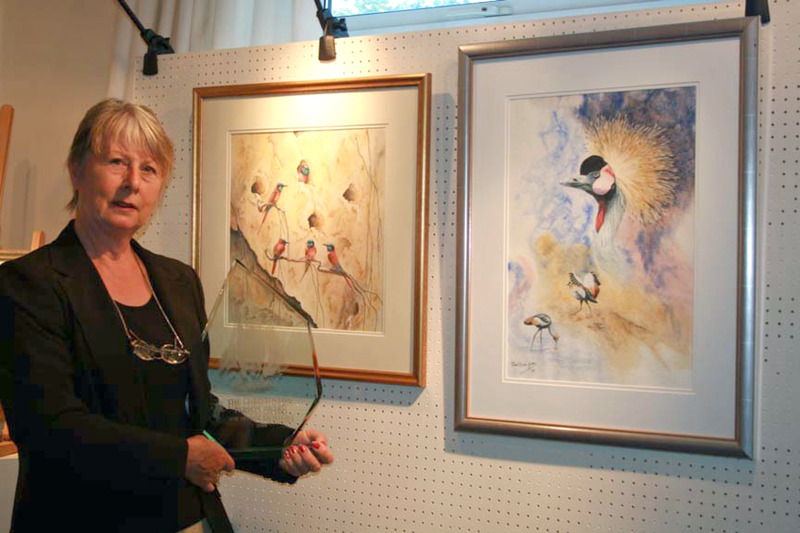 I am a Fellow and former President of The Wildlife Art Society International and exhibit regularly with their regional and national exhibitions. In 2008 I was awarded the society's top accolade "The Christopher Parsons Award for Artistic Excellence". This award is presented for a portfolio of 4 specific paintings under a connecting theme. My work, which is inspired by my annual trips to Africa, is mainly watercolour with some pastel and pencil work which I often combined with washes of water based media. With the need for individuality in wildlife art I recently began exploring the interaction between birds and animals in my compositions, with the bird taking pride of place. I have also combined wildlife subjects with human portraits and behaviour in a symbolic way. Most of my work recreates either the atmosphere or drama of a wildlife encounter. In some of my current work I have experimented with the use of monochrome for the majority of the painting with the focal point done in colour which then 'bleeds' into the main part of the work to avoid creating the effect of two separate pictures. Although watercolour is not a medium favoured by most wildlife artists I enjoy it's challenge and the wonderful unexpected results from using it wet into wet for some subjects. Although I endeavour to paint wildlife with realism and conviction I prefer to use subtle watercolour washes to suggest habitat and create atmosphere rather than attempt 'photo realism'. However, for more detailed work I often combine it with pastel, pencil or watercolour pencils. 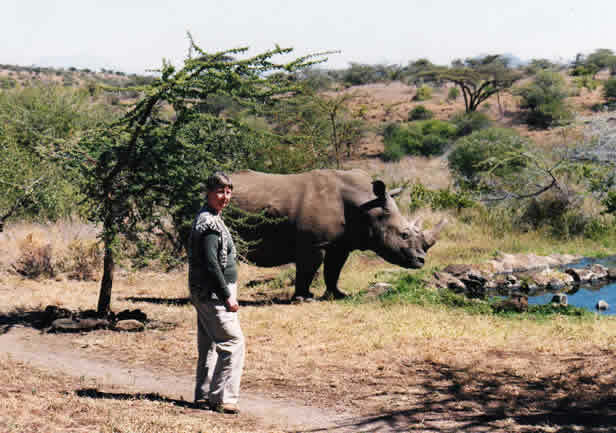 I have been fortunate to visit Africa annually for over 15 years and this is where I get my reference and inspiration. All my paintings are based on real life events which I have witnessed. Apart from the Wildlife Art Society exhibitions my work has been exhibited and sold through Sotheby's Wildlife Art Auctions, Nature in Art, Northern Exhibition of Wildlife Art and various regional and national exhibitions. I regularly give illustrated talks about Africa and the inspiration for my work, hold workshops and have written articles for a number of travel/art magazines. 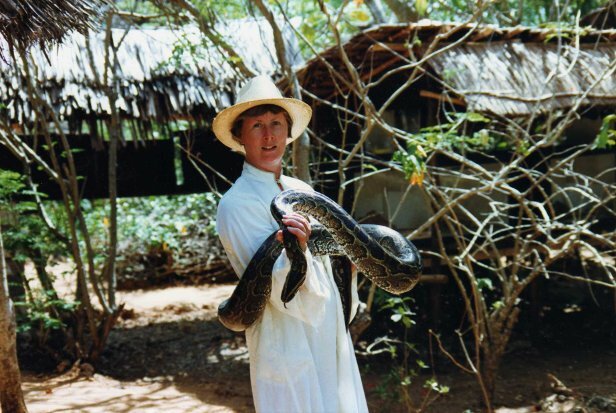 I have been travelling to Africa regularly for the past 18 years and during that time there have been many memorable experiences, some of which have led to successful paintings. From the very first time I set foot on that continent it has been the inspiration for most of my work. As I say in the introduction to the illustrated talk "A Brush with Africa" it is a huge continent of great diversity and contrast from the habitat and wildlife to it's people. During my visits I have explored most of Kenya's reserves from Samburu to the Masai Mara and in Tanzania how can one forget the unique natural caldera that is the Ngorongoro Crater. To see the wildebeest migration in the Serengeti and the Mara is to witness one of natures great events. Perhaps for me the remote wilderness of the Selous in Tanzania and the Okavango Delta of Botswana are the jewels in the crown. One never tires of seeing the same animals because you never know when something special will happen before your eyes. To witness lions hunting and marvel at the speed of a cheetah in full flight. To see the strange sight of a Tawny eagle plucking feathers from an egret high up in a tree or to watch as African Wild dogs return from hunting to feed the pups at the den, these are privileges indeed. One of the most unforgettable experiences took place in Botswana, when we came across a pair of mating leopards, so oblivious to our presence that we watched them for over an hour. Normally so secretive, it was highly unusual to find them within a large open area of grassland and this became the painting 'Burnt Ebony's Bride'.